Algoryx Simulation AB and Beijing Longtek Technology Co., Ltd., have been selected to provide advanced virtual reality (VR) solutions to Aviation Industry Corporation of China (AVIC), one of the world’s largest aerospace conglomerates. Longteks integration of AGX Dynamics from Algoryx into its next generation VR software platform MakeReal3D v3.0 enables AVIC to use high fidelity physics simulation when developing their assembling and manufacturing procedures. VR technology has been out and popular for a quite long time, mostly used in gaming, operator training and marketing. With help from AGX Dynamics, Longtek can take MakeReal3D v3.0, their next generation of VR simulation platform, into the domain of industry and manufacturing, especially for virtual assembling/disassembling simulations. Longtek has won the fierce market competition and selected to provide VR simulation systems to AVIC, Aviation Industry Corporation of China. Aerospace continues to be one of the most advanced and demanding industries, integrating solutions from basic science, technology, industry and manufacturing. Application of VR technology in aviation not only demonstrates what the aircraft looks like, but can also verify the workflow of styling and assembling/disassembling procedures. For instance, when the CAD design is ready, VR is used to validate the assembling procedure – e.g. how to assemble all units in a particular order into one assembled component, and will also show if the designated assembling space is large enough for workers to do the job. AGX Dynamics, performing high-fidelity realtime physics simulations, helps MakeReal3D v3.0 and its customers to carry out workflow verification in VR simulation. The assembling part can collide with all other parts (rigid bodies and cables) like in the real world and therefore many mistakes can be avoided before going into real production. Figure 1 Verification of disassembling a generator from aircraft. ”We believe that this collaboration between Algoryx and Longtek will make VR technology increasingly more important in the development of aviation products, in particular on the huge chinese market”, says Kenneth Bodin, CEO and co-founder of Algoryx. Longtek is a leading technology corporation in China, providing professional virtual reality systems and solutions among industries of aerospace and aviation, high-speed rail, transportation, research academies and institutes. Longtek was founded in Beijing, China in 2003. Today Longtek has 4 branches in Hong Kong, Shanghai, Xi`an and Chengdu. The product MakeReal3D v3.0 is a virtual reality simulation platform fully designed and developed by Longtek. 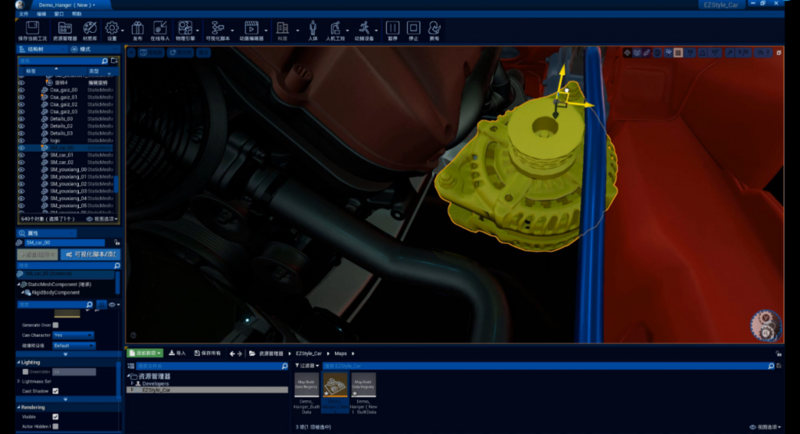 MakeReal3D v3.0 focuses on industrial applications such as digital mockups, virtual assembly and disassembly, virtual maintenance, and human factors analysis. Algoryx is a global market leader in industrial-grade real-time physics simulations for human-in-the-loop operator training, for engineering applications, and for virtual product development and design. Algoryx provides solutions to a wide range of markets including automotive, cranes, heavy equipment, off-road vehicles, automation and robotics, off-shore and maritime, bulk material handling and mining. Algoryx was established in 2007 and has its headquarters in Umeå, Sweden. AGX Dynamics from Algoryx enables entirely new business areas and use patterns for simulation, in particular when addressing the challenges of digitalization and machine learning.